The final stage of the game; congratulations on making it this far. Start of the final stage. You'll begin the stage at the bottom of a pit. About half way up there are two holes, one on either side, that spawn caterpillar bots. You can harvest these to fill up your sub tanks if they aren't already full (you'll need all four). Destroy the bots if you need the energy or extra lives. When ready, simply hop up to the very top. Velgauder is Sigma's pet, extremely fast, agile, capable of firing electric orbs and long flames. He'll immediately jump onto the wall on the left, then dash to the right. Once he comes towards you, wall dash over him and shoot him with the Shotgun Ice. Scale the opposite wall and repeat until he is dead. Alternatively, you can also hide in one of the corners, but Velgauder will eventually get to you from the ground, so right before he's about to jump for you, release and shoot him while you're falling. Sigma's fight is very similar. As soon as the fight starts, equip the E. Spark and hide in the left-hand corner. 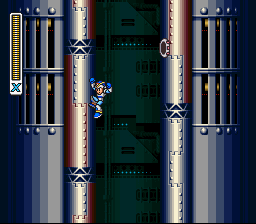 Stay here until Sigma is scaling the wall: when he is about to jump towards you (on his fifth or so pass), immediately drop straight down and shoot him in mid-air. As he begins to jump back down prepare yourself to wall climb back up to where you just were. Right before he's about to reach you, hop fire a shot, then continue up the wall. If done correctly, you'll hit him once more and make it to safety without getting hurt. You shouldn't need to move to the other side of the room, but be prepared to dash jump if need be. 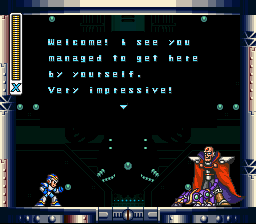 Sigma survives and merges with Velgauder to form a large, deadly robot. This fight is fairly simple: first, equip the Rolling Shield, as it's the only weapon that does significant damage (besides the fully-charged X buster, but it does less damage). Stay in the center and wait for one of the claws to come towards you. Jump on it and stay to the very left (or right) of it. Once it gets to the top. Jump and shoot at Sigma's head with the Rolling Shield. Repeat this until Sigma finally dies. Note that Sigma will shoot flames and orbs at you while you stay in the center of the room. You can dodge both attacks easily while you wait for the claw. Get Rolling Shield out and stand in this position. Jump straight up as the claw moves toward you to land on it. Congratulations on beating the game! You'll now be rewarded with a segment about Mega Man's ongoing inner struggle and some good old credits. 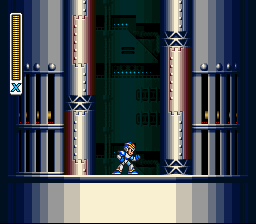 Mega Man's fight never ends! This page was last edited on 4 August 2018, at 06:35. This page has been accessed 161,322 times.